Mommy Delicious: "For Kids Only" Program at The Sports Club! One of the best things about raising a son in NYC is that this place is filled with centers and facilities built with just kids in mind. As I said earlier this week, Aiden and I didn’t take a summer vacation, but we made our love, NYC, our playground. During the beginning days of summer, Aiden and I visited TheSports Club LA’s For Kids Only Child Enrichment Program located on Manhattan’s Upper East Side. One of the first things we did once we arrived, at Aiden’s request of course, was change into our bathing suits and jump in the pool. Being the social butterfly that he is, Aiden quickly made a friend and they played their own little version of “Marco Polo” for a while. We were also able to head up to the Open Play childcare play area where there was rock climbing (for kids ages 6 and up, I believe), toddler play (there was a lot of “play” on Aiden’s part), and a bounce house. Once we were finished with Open Play (it was hard to drag the kid away from that), we took a tour of the facilities to view the rooftop outdoor lounge area, the fitness center, and the spaces where the classes, parties, and pre-school alternative programs are hosted. 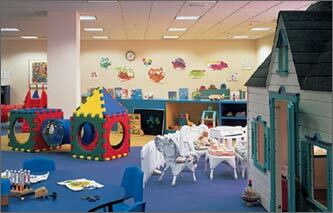 The For Kids Only Childcare areas are colorful, inviting, and kid-centered. It’s filled with a dramatic play area, puzzles, teddies, building blocks, books, art and crafts supplies – anything you can think of to keep a kid entertained while their parent is working out. I was really in love with the wall art and décor. The birthday party packages are pretty much one-stop shopping. The events coordinator will take care of the entire 2-hour party from set-up to clean-up, and you can choose from several activities like rock climbing, gymnastics, movement, carnival-style, art, music – you name it! The locker rooms are neat and clean and there were lots of extra towels on deck. The swimming pool was clean and the water was a good temperature, although there was no Lifeguard on duty. The food in the café was delicious and visitors are able to order from the grill or select a lunch or snack that’s pre-packaged. All in all, we had a lovely time and hope to visit again sometime soon. That is pretty cool. Don't have those around here. It's a great idea to have kids get on the move, especially with obesity rates on the rise. Hopefully more places will make their gyms kid-friendly, too! I always loved the concept behind these clubs. It's a perfect marriage between parent and child. You really can't go wrong. That's amazing! I wish we had something like that in Boston, my daughter would be in HEAVEN. This looks very kid friendly. Bright colors, various interactive stations...alll good for keeping kids entertained and physically active.